Overlooking the picturesque fishing harbour and ancient fort of old Pafos, Annabelle Hotel is an exclusive five star hotel of elegant charm and style. Set in lush tropical gardens with glittering free-form pools, waterfalls, and gently swaying palms, Annabelle is renowned for its outstanding cuisine, impeccable service and deluxe accommodation. Annabelle is a member of Preferred Hotels of the World and part of Thanos Hotels which includes Anassa and Almyra hotels. Clients staying in one of the three can also use the facilities of the others. 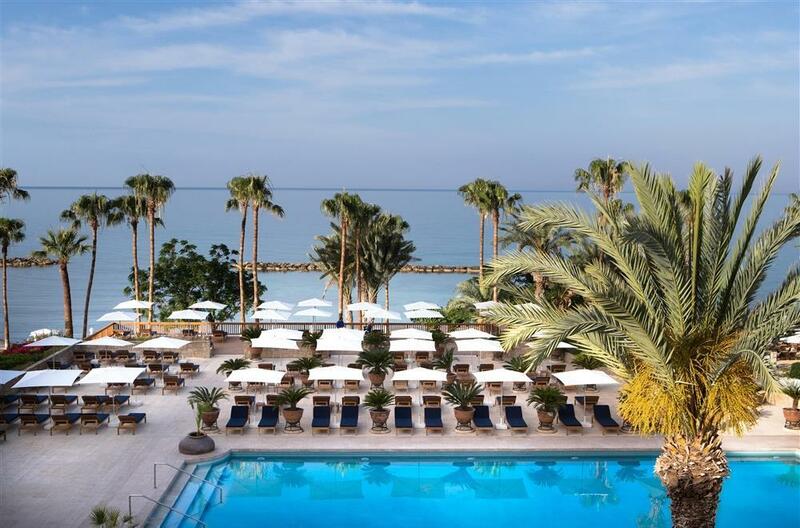 Annabelle Hotel sincerely welcomes you to a family-run oasis set within six acres of lush gardens on Paphos’ UNESCO-rich waterfront. Cool, peaceful interiors, understated design and warm, caring service combine to create a distinct atmosphere of unpretentious elegance. 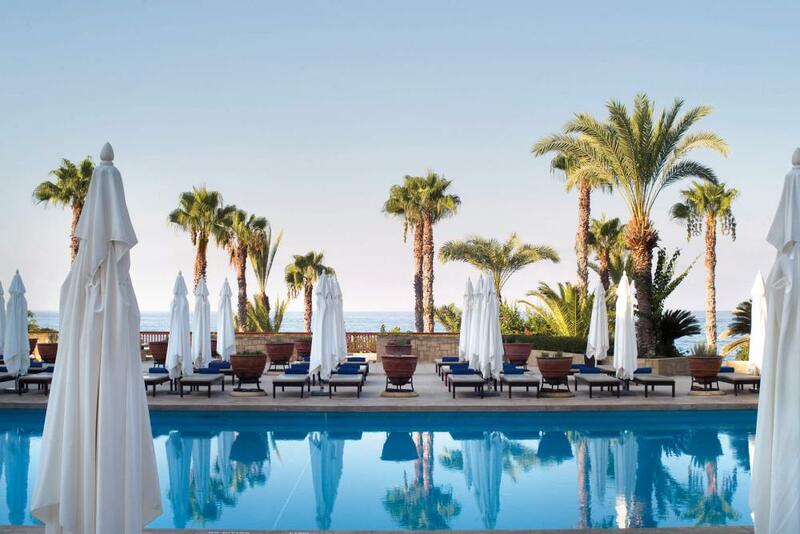 Looking out over magical gardens of glittering free-form pools, waterfalls, vivid tropical flowers and gently swaying palms towards the blue horizon of the Mediterranean, Annabelle is an exclusive five star hotel of unforgettable luxury and elegant charm. For the seeker of sophistication and beauty, the five star Annabelle is ideal. Overlooking the picturesque fishing harbour and ancient fort of old Pafos, this elegant and luxurious hotel has been designed with great care and attention to detail. From the elegant wood and marble in the lobby to the classical decoration of Greek statues, Annabelle interiors are tastefully decorated and utterly peaceful. From the moment it was built, Annabelle has enjoyed its well-deserved reputation as a place to relax with luxurious accommodation, outstanding cuisine and five star service. Annabelle Hotel is family owned and run, so it has a genuinely friendly, welcoming and attentive atmosphere. This delightful hideaway has built up a reputation based on word of mouth recommendation, with guests returning year after year to experience the glorious seclusion, helpful service and highly acclaimed cuisine. Whatever your holiday expectations, you’ll experience true luxury and perfect relaxation at Annabelle Hotel. 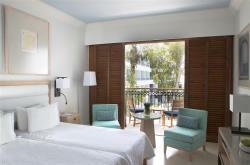 Annabelle has 218 rooms and suites, all luxuriously furnished and each with its own private terrace or balcony. 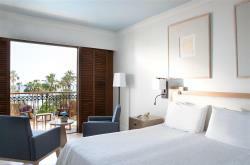 Annabelle boasts a number of Suites with magnificent views to the azure Mediterranean Sea and the hotel’s gardens. All suites feature marble fitted bathroom facilities, comfortable sitting and dining areas and spacious balconies, and some with outdoor whirlpools or private plunge pools. Furnished with impeccable taste, they are the perfect choice to chill out in an elegant yet relaxed atmosphere. 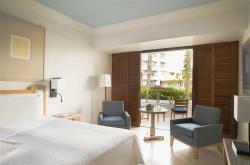 These rooms are furnished with either twin or double beds and have marble bathrooms, cool marble floors and balconies. They have views towards the town of Pafos and/or the hotel. Some rooms interconnect. Free WiFi is available in all rooms. Maximum capacity of two adults and an infant. Opening onto the hotel’s tropical gardens, these ground floor rooms each have their own private terrace furnished with table and chairs. Free WiFi is available in all rooms. Some rooms interconnect. Maximum capacity of three people. 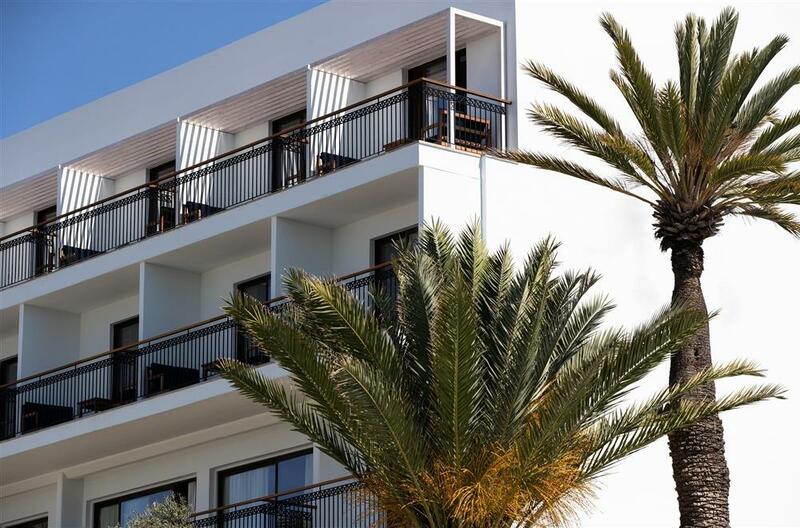 With superb views of the sea and the hotel’s tropical gardens from step-out balconies, these rooms are larger than Inland View Rooms and have either twin or double beds, marble bathrooms and cool marble floors. Some rooms interconnect. Free WiFi is available in all rooms. Located on the ground floor, these rooms have views of the sea and the hotel’s pools. 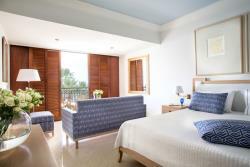 Each room has an extensive terrace with table, chairs and private sun lounger. These rooms are furnished with large flat-screen TV sets with either twin or double beds; some rooms interconnect. These spacious rooms occupy a prime position and showcase uninterrupted views of the Mediterranean Sea and Paphos harbour from large balconies. 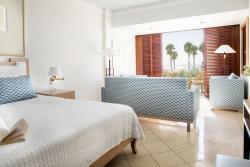 Deluxe sea facing rooms have extended bathrooms with seperate walk in shower cabin and large flat-screen TV sets. Situated in the hotel’s tropical gardens, these sea-facing Greek-style suites consist of open-plan bedroom and living room plus two private patios: one sea-facing and one overlooking the gardens and the waterfalls. Suites have large flat-screen TV sets, and some suites have a working fireplace. Maximum capacity of two people. Situated on first floor of the hotel, these bright and airy suites have views across to the Mediterranean Sea and Paphos harbour. The layout includes open plan bedroom and living room with large flat-screen TV sets, plus marble bathroom with walk-in shower. Situated in the hotel’s tropical gardens, these sea-facing Greek-style suites consist of open-plan bedroom and living room plus two private patios: one sea-facing, furnished with a private heated whirlpool, and one overlooking the gardens and the waterfalls. Some suites have a working fireplace. Free WiFi is available in all rooms. 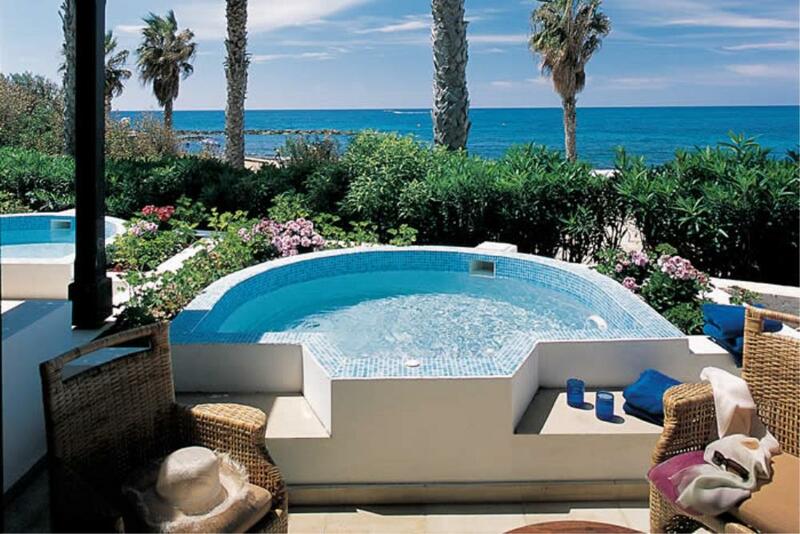 Situated on the ground floor of the hotel, these bright and airy suites have the added luxury of an outdoor heated plunge pool with views across to the Mediterranean Sea and Paphos harbour. The layout includes open plan bedroom and living room plus marble bathroom with walk-in shower. Free WiFi is available in all rooms. Some of the finest cuisine on the island can be found at the Annabelle and theme nights take you on a culinary expedition around the world. Gourmet cuisine with a Far Eastern flavour at Asteras, contemporary French at Amorosa, authentic Cypriot fare at Mediterraneo, accompanied by live music, or the option of eating at Almyra. Half board / Full board arrangements at Annabelle or Almyra may also be used at either hotel. A selection of bars is available serving thirst quenching cocktails, whilst live music can be found in the lobby bar most nights. Outside, in the sunshine, two pool bars provide drinks and snacks all day long. Later, as the sun sets and the perfume of jasmine and hibiscus drifts on the warm evening air, you can enjoy the favourite drink amidst the elegant wood and marble of the hotel's lobby before indulging in a memorable dinner in one of the Annabelle's four restaurants. The Lobby Bar is open from 9am until 1am the following morning. Situated in the lobby of the hotel it serves beverages and light lunch snacks. In the afternoon, high tea can be taken and this is also the venue for our weekly management cocktail party. Nearby is the atrium where you can relax and while away a few hours in a delightful winter garden setting. Located off the reception area, the Byzantine Bar opens in the evening for relaxation and enjoyment. A DJ plays memorable tunes or a resident singer entertains. The perfect place for after dinner drinks, where an evening’s light entertainment is assured. The Grotto Bar with its meandering free-form pools, waterfalls, palm trees and rambling flowers creates a relaxing setting in which to wind down, enjoy a cocktail and soak up the sun. Or stay cool at the swim-in water bar. The Pool Bar is open daily for food and beverage orders while you laze in the sun or enjoy a swim in the half-Olympic size pool. The Annabelle excels in the quality and variety of its cuisine. Fresh locally grown produce, inspired menus and acclaimed chefs ensure that each of its four restaurants provides an unforgettable culinary experience. And the hotel's extensive wine cellar complements the dishes, offering everything from the delicate regional wines of Cyprus, to the finest vintages from around the world. Healthy eating options are offered, a vegetarian menu is available and the restaurants will gladly accommodate vegan, gluten-free, diabetic and other dietary requests. Children have not been forgotten, with special children’s menus and early meals available. The Amorosa Restaurant - Annabelle’s signature fine-dining restaurant is a haven of culinary sophistication, serving contemporary French cuisine in a serene atmosphere accompanied by a classical pianist. Includes plenty of outdoor space for those long summer nights. Amorosa is open only on selected nights. Head to the Fontana for extensive buffet breakfasts and dinners, vibrant theme nights and à la carte selections. During the summer months, a variety of theme nights are held and the relaxed, family atmosphere spills out onto a large terrace. The Hotel kindly asks its guests to adhere to our smart casual dinner dress code (no shorts or flip-flops are allowed). Asteras is Annabelle’s romantic choice: intimate and innovative gourmet dining at candlelit tables overlooking the illuminated water gardens. Top tip: head for the al fresco deck in the summer months – and don’t miss the weekly flambé night! Asteras is open on selected nights in high season only. The Mediterraneo Restaurant near the sea, where the Executive chef prepares Mediterranean and traditional Cypriot dishes, should not be missed. This is a taverna style restaurant situated on the beachfront with Mediterranean décor and cuisine. A daily lunch menu is offered and, in the evenings, á la carte, or themed night menus. A very popular night is the panayiri, which offers a buffet of local specialist dishes, including barbeques outside in the summer, accompanied by live music and folkloric dancers. Traditional meze style menus are also enjoyed here and a guitarist entertains you with a selection of traditional and international tunes. For those who prefer a more active holiday, Annabelle’s superb recreational and leisure facilities provide opportunities for everyone, from the committed enthusiast to the complete beginner. All the sports instructors hold internationally recognised qualifications. There is a first-class, floodlit tennis court, where lessons are available from a qualified coach, a squash court, table-tennis tables, a gym and two swimming pools, one of which is a half-Olympic size. Annabelle guests have may use the facilities of Almyraspa (situated next door at Almyra, sister hotel of Annabelle). Watersports include sailing, parasailing and scuba-diving. All watersports are provided by an external company and are available from April to November (weather-permitting thereafter). In addition rock-climbing, mountain-biking, pony-trekking and hill-trekking are available nearby. Family-friendly facilities are an integral part of Annabelle’s contemporary resort philosophy. Supervised clubs for guests aged 4 months to 11 years. The Explorers Clubs (extra charge) are based at the sister hotel of Annabelle (Almyra is situated adjacent to Annabelle). Annabelle also provides an excellent babysitting service (extra charge); innovative ‘Baby Go Lightly’ pre-order service; children’s menus in most restaurants. Location Annabelle has the advantage of direct access to a wide gardens and the sea, as well as within walking distance of shops, castle, house of Dionysos with its unparalleled Roman mosaics and many other attractions in and around Paphos. Paphos (or Pafos) is one of the most beautiful and ancient towns of Cyprus. Wherever you set foot in Paphos each place has its glorious history which dates back to thousands of years, when cult of goddess Aphrodite who emerged from its seas, flourished in this beautiful part of the world and attracts many visitors from the island and abroad. Paphos (or Pafos) is one of the most beautiful and ancient towns of Cyprus. Paphos history thousands of years which dates back to Aphrodite, who emerged from the sea off the coast of Cyprus. Today Paphos is not a big city with a harbor, and in the Hellenistic era and Roman times it was the capital of Cyprus. Paphos with its beauty and majestic scenery was included in the UNESCO list of World Heritage, among the treasures were discovered mosaics Taseya and Iona survived underground for 16 centuries, the Tomb of the Kings, the ancient theater of the Odeon and other attractions you can visit to stay in this beautiful city . The Annabelle health centre offers a squash court. Annabelle guests can however avail of all the facilities of Almyraspa, a holistic utopia complemented by fantastic sea-views, at the adjacent sister hotel, Almyra. Almyraspa is a holistic utopia complemented by fantastic sea-views. 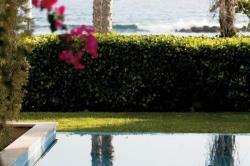 It has recently been voted Spa Finder’s Readers and "Favourite Spa in Cyprus 2012” for the second year in a row. Six treatment rooms and three spa suites offer therapies using products from Osea, QMS and Ila. 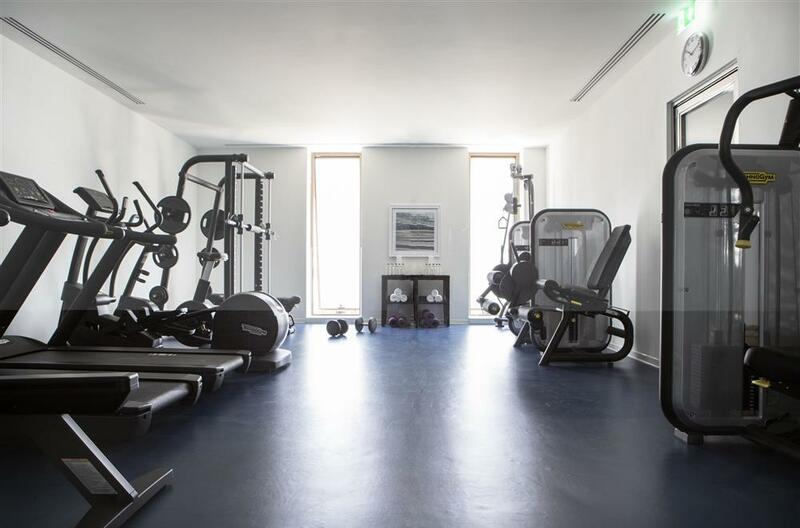 The Spa has an indoor pool, outdoor infinity pool, yoga deck, saunas, steam rooms, Vichy showers, gym, hair salon, tennis court and Eauzone restaurant. Almyraspa is a holistic, adults only, utopia where wellness, health and beauty merge into one. The aim is to deliver the highest quality treatments in luxury surroundings to promote health, beauty, well-being and vitality. OSEA is a naturally derived marine based skin care line that provides effective high quality spa products that are pure, immediate and simple. Natural ingredients include seaweed and pure organic essential oils and botanicals from around the globe. All are biodegradable and 100% guaranteed. ILA is a British ‘Beyond Organic’ Luxury Skincare & Spa Brand. Treatments are based on yogic healing and marma therapy. They combine techniques to harness the products’ energy as well as that of the therapist and the guest, which results in experiences with a deep healing effect. Ingredients such as rose, orange blossom, olive oil, thyme, honey, rosemary and rose geraniumare synergistically combined in treatments and bathing rituals. QMS Medicosmetics is medical grade skincare that originated from clinical research into critical role of collagen in skin regeneration and is designed to effectively treat damages and aging skin on face and body returning it to a more youthful and healthy state. Kindly note that Almyraspa is only open to guests aged 16 and above. Between November and March, the indoor pool is open to children between 9am and 1pm, and is heated to 28° C.
If you are planning to invite a large number of guests to a glittering ball, a major presentation or conference, an anniversary, a wedding, an exhibition, concert or fashion show, the Athenaeum ballroom provides a prestigious ambience for up to 400 people. This grand room has a floor area of 350 square metres, a height of 4.5 metres and a separate elegant foyer, which, at thirteen metres by six metres, acts as an excellent pre-function reception, or information area. The ballroom can be serviced directly from the main kitchen. Two smaller rooms, the Aphrodite and Ariadne, each have a floor area of 53 square metres and can be inter-connected. They are perfect for small meetings or as syndicate rooms. Both are situated on the mezzanine level above reception and have natural light from large windows. The classical amphitheatre is located outside by the waterfalls. It has three levels of seating and a stage. It is used for dinners, cocktails and concerts. Annabelle has a separate business centre with computer, email and fax facilities. The hotel’s secretarial staff can provide typing and photocopying services as required. *The Meal upgrade from BB to HB (where applicable) is valid only for Buffet Dinner at the Fontana Restaurant. (The free Half Board Special offer is not valid for lunch or at any other restaurant at the hotel). The experienced nannies will take time to discuss your child’s routine and go out of their way to follow it, to help keep your child happy and settled. The daily activities have been tailored, taking into account the weather and of course the fun factor. Complimentary nappies, swimming nappies, wipes,fresh milk, purees are provided. Meals are freshly made and prepared on a daily basis(for full day sessions only), When it’s nap time, they can settle down in the specially designed sleep room. This age group is kept busy with lots of fantastic activities. Children can get creative with locally inspired activities like designing their own mosaics, baking delicious Cypriot cakes or taking part in traditional Cypriot games in the garden, organised by the amazing Explorers childcare team. kitchen garden. When they do have some chill out time, an area full of toys and games welcomes them where they can catch up with their friends. There is a busy and energetic programme of sport and activities organised and most of the activities will be spent out and about amongst the resort. Baby Go Lightly offers parents the opportunity to order every manner of baby item in advance of travelling, so all that is left for you to do is to carry baby on board, with plenty of room for your holiday gear. All items ordered will be waiting in-room on your arrival. From pre-ordering a car seat in the taxi or rental car airport transfers, to specifying the language for in-room story books and DVDs, to providing in-room amenities such as potties, high chairs, dry and swimming nappies, nappy bins, sterilisers, extra bottles and teats, baby gyms, carrier pouches, child buggies, baby walkers, baby bath amenities (including baby lotion and baby powder), bottle warmers, crayons and colouring books, baby travel wipes, swimming flotation aids, lavatory training seats, and baby bathtubs, Baby Go Lightly has it. And should there be any special request that Junior just can’t do without, the Guest Services team will be delighted to oblige! In addition, Anassa offers qualified English-speaking babysitters and children’s menus in the restaurants. The relevant pre-order form should be completed and sent to the hotel prior to guest's arrival. The order form is available on request and all charges are payable at the hotel diretctly. A maximum of 3 children are allowed per babysitter. The Babysitters are experienced and not necessarily hotel employees. All charges will be posted to the guests account. For cancellation less tham 3 hours before the time of the booking, a 1 hour cancellation fee will apply. department of the hotel - Prepayment is required in order to guarantee child's place. All above information and rates are subject to change without prior notice.